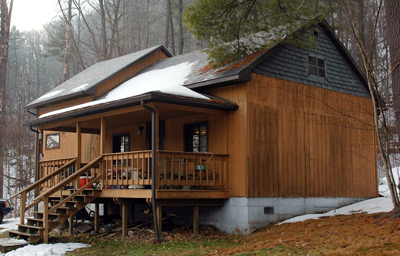 Founded in 1986, Camp F-Troop lies among the steep, wooded hills above the Allegheny River in southern Warren County. Adjacent to State Game Lands 86, F-Troop serves as the home base for a revolving cast of characters and outdoor activities. Trips such as the March 10th Motorcycle Pete Retreat, the Trout Season Opener, the August Fireside Philosophers Gathering, and, of course, the Deer Season Opener are annual events true camp members rarely miss. F-Troop hosts it all – great food, target-shooting at the backyard range, nature hikes and mountain-climbing, wild brook trout prospecting, deer, grouse, squirrel, and turkey hunting adventures, tall tales of past hunts and fishing trips, spotlighting for deer, and sometimes late-night card games. Central to each trip is the evening campfire. It’s the perfect venue for open-pit venison cuisine and some good old country fellowship. Every visit to Camp F-Troop since its founding more than 30 years ago has been captured and archived in the large, three-volume, loose-leafed F-Troop Camp Journal, a priceless compilation of photographs and commentaries about camp activities from 1986 to the present.